April steelhead goose eggs and morels. Came across this Canada goose nest with six eggs on a spit of land sticking out into the Rogue River. 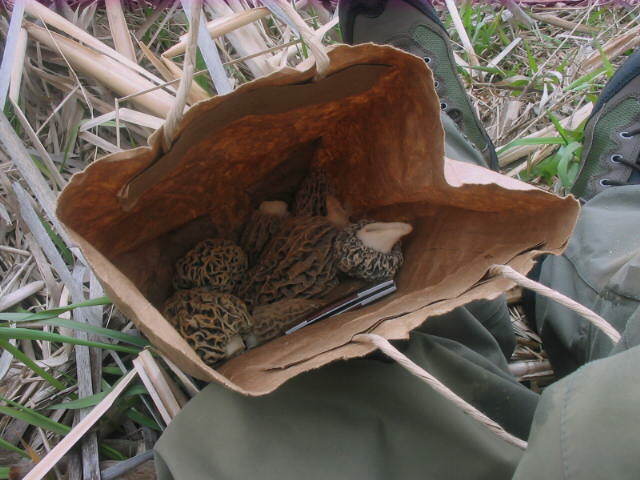 Bag of large yellow morels gathered while flyfishing steelhead on the Rogue River. Took time for a hiking river sortie on the Rogue River today. The river is looking fine, clear water and down to 1450CFS. I could wade across the width at several key locations…prime for my accessing by foot good steelhead lays. Laid a big goose egg as far as catching a nice fresh upper Rogue steelhead. I’ve found this happening before in April, the steelhead are on the move, out of reach up the tributaries, busy spawning or maybe the better numbers or fish are somewhere further up river. You just have to be lucky and find a fresh receptive one here or there. I got lucky and found more fresh (and good sized) yellow morels on private land. I also stumbled upon a lone Canada goose sitting out on a point near the river. 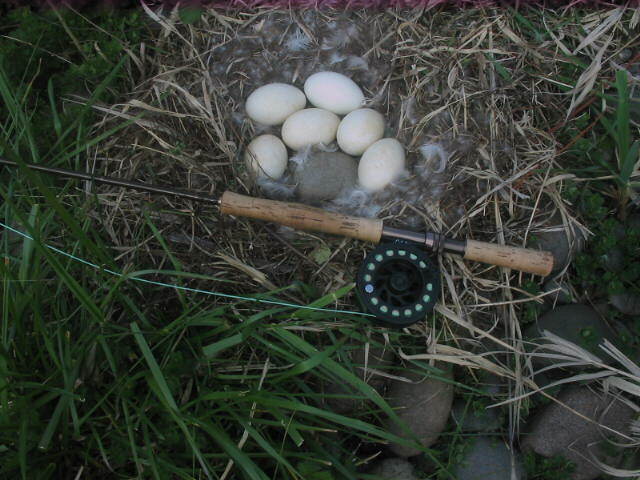 She had also laid an egg…actually six of them! This entry was posted in Flyfishing, morels, Rogue River Report and tagged anadromous fish, cold water steelhead, Flyfishing, Flyfishing Guiding, morels, Neil Selbicky, Oregon, Rogue river blog, Rogue River steelhead fishing, Rogue Valley weather, scenic river canyons, wild edible mushrooms. Bookmark the permalink.